This set includes a white long sleeve one piece and a pair of hand dyed kakabaka leg candy. These leg warmers have been hand dyed to a funky green mix. 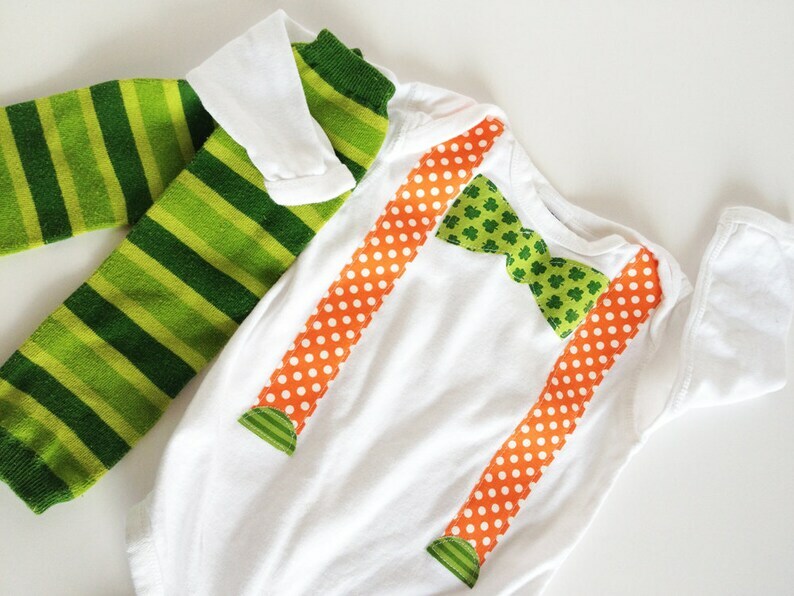 one piece is appliqued with a bow tie cut from custom dyed shamrock fabric and orange polka dotted fabric. All appliques are top stitched with the kakabaka signature white stitch. Edges are designed to fray over time. *sizing recommendations are based on average sizes for age groups. These leg warmers have been hand dyed in the kakabaka flavor maker to a custom color. I use professional fiber reactive powder dyes, not the dyes you buy off the shelf at your local store. These dyes produce brighter colors that last! All items have been washed in Dreft before they leave my studio, which is both pet and smoke free, of course. Please check out my shop announcement section for current turnaround time (http://www.etsy.com/shop/kakabaka). Your goodie will ship first class parcel post.